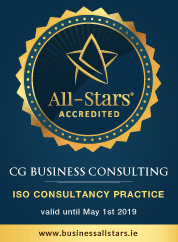 Your organisation could benefit from a FREE ISO 45001 Consultation with CG Business Consulting. Built along the same lines as ISO45001 management systems that emphasise effectiveness, efficiency and continual improvement of a management system. It focuses on the fundamental requirements based on the highly successful “plan-do-check-act” method. The company is in an elite category of business and internationally recognised.ISO 45001 puts your organisation on a level of excellence shared by organisations worldwide. Satisfies demands of current or prospective customers for registration. A superior pool of clients that accept competent and prospective businesses. Increased acceptance by regulators, the public, and interested parties. Accepted as being proactive about Health and Safety and continual improvement. Improves business performance. A well designed, well implemented ISO 45001 health/safety management system reduces workplace illness and injury and increases productivity. Creates consistency throughout the organisation built around “best practices”. Provides a platform for attracting lower insurance premiums and proves due diligence to the marketplace. Allows better identification of hazards and risk. Ensures compliance with all current legislation worldwide. Improves the efficiency of internal operations, reduces accidents, dangers, and downtime. Improves the safety of all persons affected by the company’s activities. Improves management oversight. Incorporates monitoring and measurement of key performance indicators in health/safety. This gives management objective data upon which to base decisions. Internal auditing is an “early warning system” to help you spot health/safety threats – giving you the chance to address and resolve them before they are detected by others, rather than after. Facilitates continual improvement. Employee morale, insurance costs, liability, etc. not to mention simple human concern for the welfare of others — nothing in a business is more important than improving health/safety performance. Transforms your operation from detection mode to prevention mode. The benefits of Implementing ISO are endless and when implemented correctly it provides the company with an effective tool that will show a return on investment. With continued increases in insurance premiums, increased injury claims and spiralling health care costs the question companies need to ask themselves is can they afford not to implement ISO 45001. I would like to give a personal thanks to Caroline for her help. Your quality of work, in-depth knowledge and personal attention is second to none. You provided a customised high performance management system that enabled us to achieve ISO Certification in less than 16 weeks! Your support throughout the process was fantastic. Keep up the good work and we are looking forward to working with you throughout the coming years. CG Business Consulting Ltd and particular Caroline Geoghegan met Hegarty Demolition Ltds certification requirements for ISO 9001, 14001 & OHSAS 18001 in a quick and efficient timeline in which no other Consultant Body could meet or deliver. Their understanding of our sector, pragmatic approach and the tangible feedback from the detailed audit reports were invaluable in implementing these systems into our Organisation. We therefore have no hesitation in recommending them to further prospective clients.